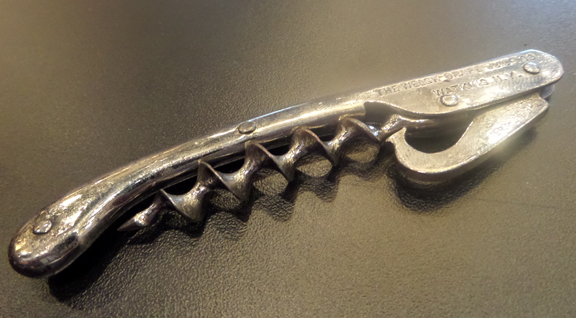 Yesterday, a “better” corkscrew arrived. 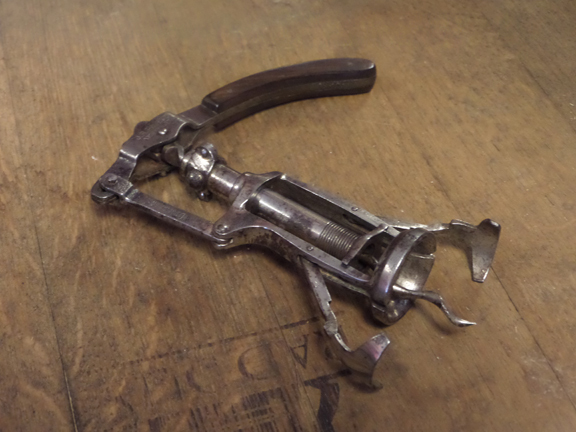 Just a few days ago, a nice Perille corkscrew was made available online, and after a few emails, and a bit of negotiation, a deal was struck. It arrived yesterday, and it is simply stunning. The finish is almost all there, and the helix is sharp. At this point, and hopefully 6 other corkscrews that are even better than this one turn up over the course of the next few months, it should make my best 6 for this year. 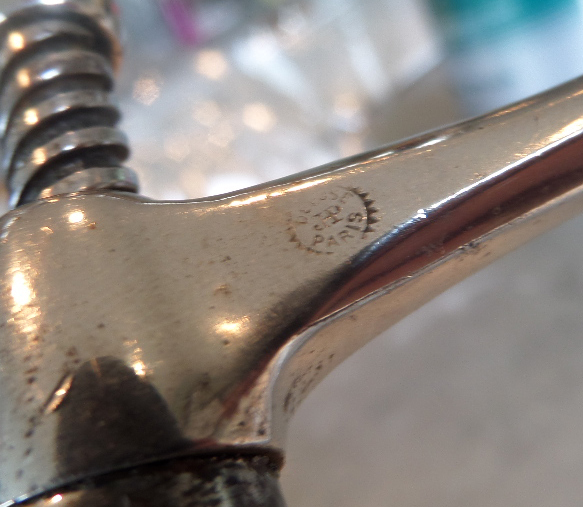 Marked with the JHP mark, and for the the Quincallerie that sold it, it is pretty darn cool. Okay… so, Best 6 of 2013 will be Frary with Hammer, Spike, and Hercules Frame, Perille Manivelle, and….I still need four more!!! Maybe at Brimfield (which starts on Tuesday) another candidate to make the list will be found. 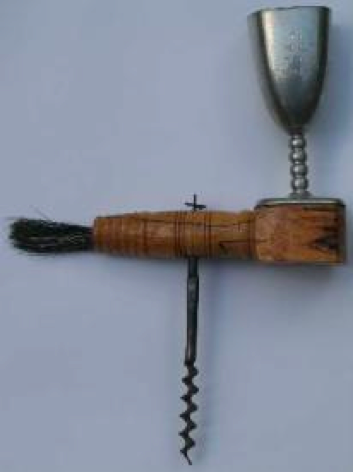 Every once in a while, I will be thumbing through O’Leary’s book on American corkscrews, and I will run across a photo and think to myself (and to be honest, sometimes I say this aloud) why haven’t I ever found this. One of these particular items isn’t that desirable, and unless you care about can-openers with corkscrews attached, you might just skip that page. 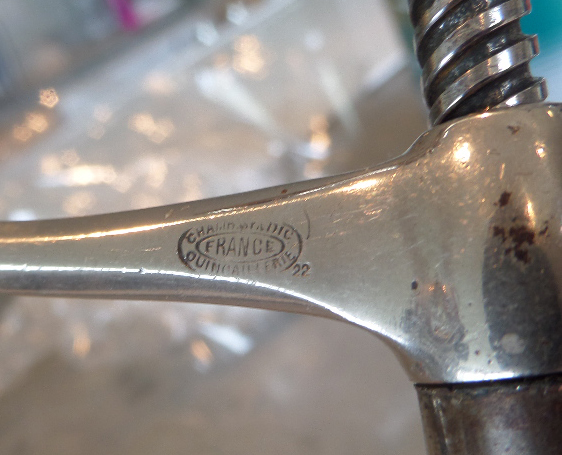 Well, probably not as the reverse page features the Dodge patent, the Rees patent, and a Gilchrist bar screw. 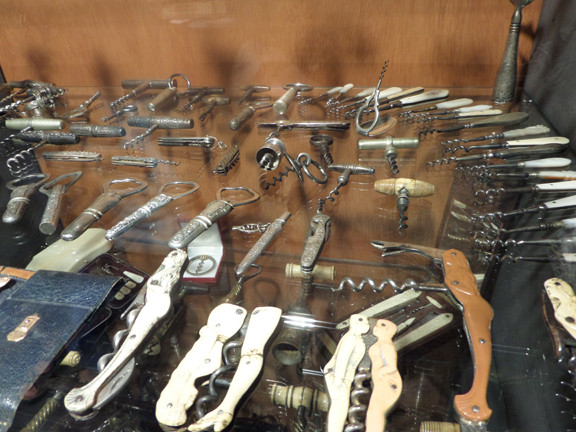 Still, in all the years of hunting and gathering, I have yet to see this particular corkscrew available for sale. As luck would have it, the other day one turned up. 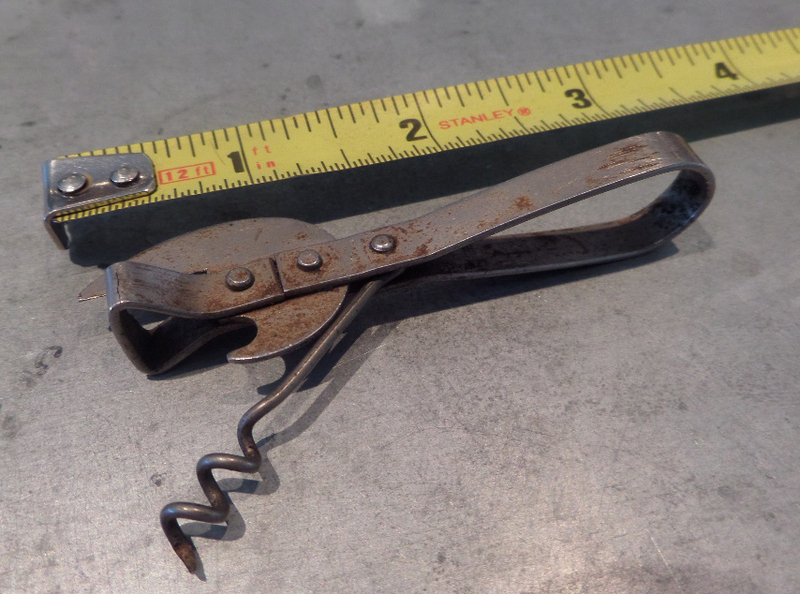 A small simple can-opener with corkscrew, it is and 1908 Clark W. Reynolds patent–which was assigned to The Browne and Dowd Mfg. 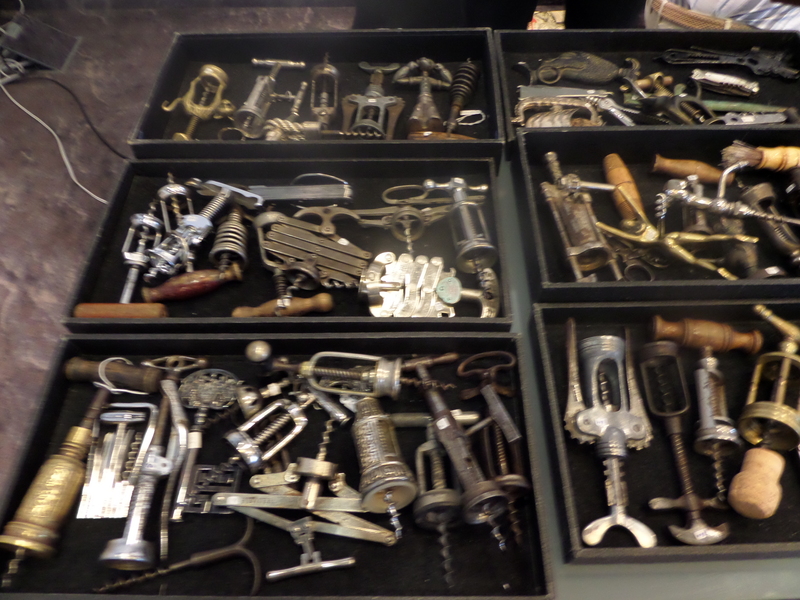 Co.
On another corkscrew note, there is an antique show on the mainland tomorrow, and I will be heading over. 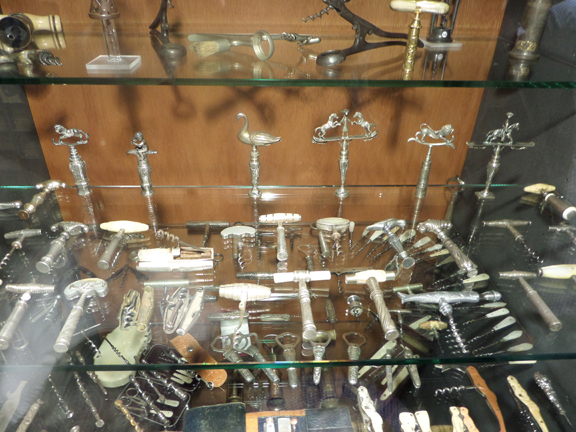 Billed as 70 “fine” antiques dealers, I am guessing if there are any corkscrews to be had, they will be given “fine” prices. But, why not give it a shot. 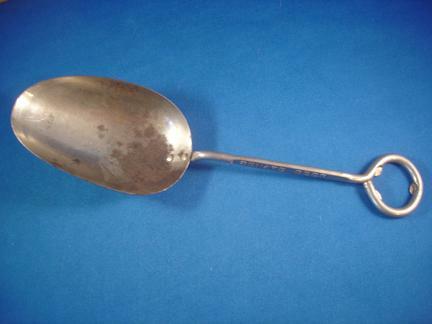 And, of course the Brimfield countdown has begun. Just 7 days until the September show! 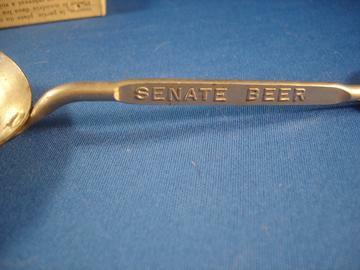 Several years ago, while antiquing with Mark (aka Orrin Painter) in the DC area, I found an opener with an advertisement for Senate Beer. 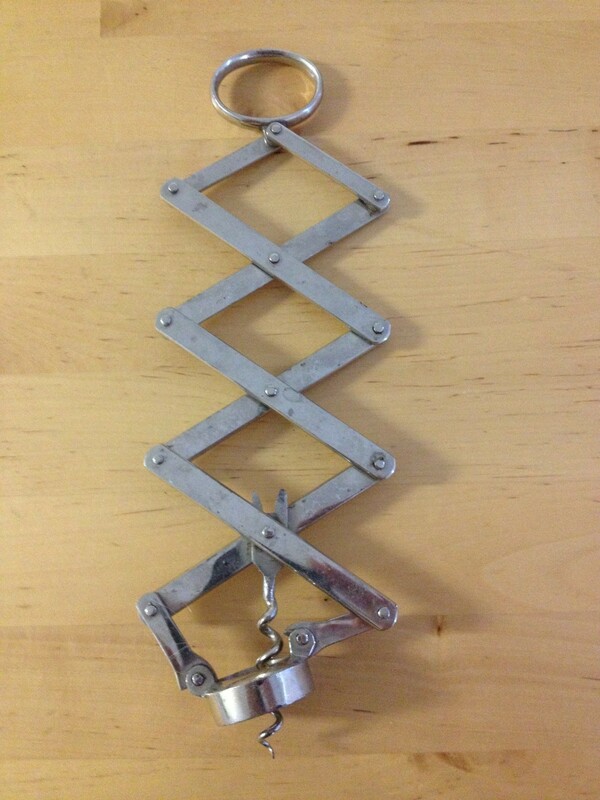 Mark explained that TWJ had told him that DC brewery openers were hard pieces to find. So, after paying my 10 dollars for said opener, I knew I would bring it to the JFO. At that year’s JFO, after a bit of negotiations, TWJ ended up with the opener. About a year later, I managed to find an M-73 with an advertisement for Senate Beer (made by Charles Heurich Brewing) and by the end of the JFO meeting that year, TWJ had made a deal for that one as well. As you would have guessed, at the Just for Openers meeting that year, TWJ snapped it up. 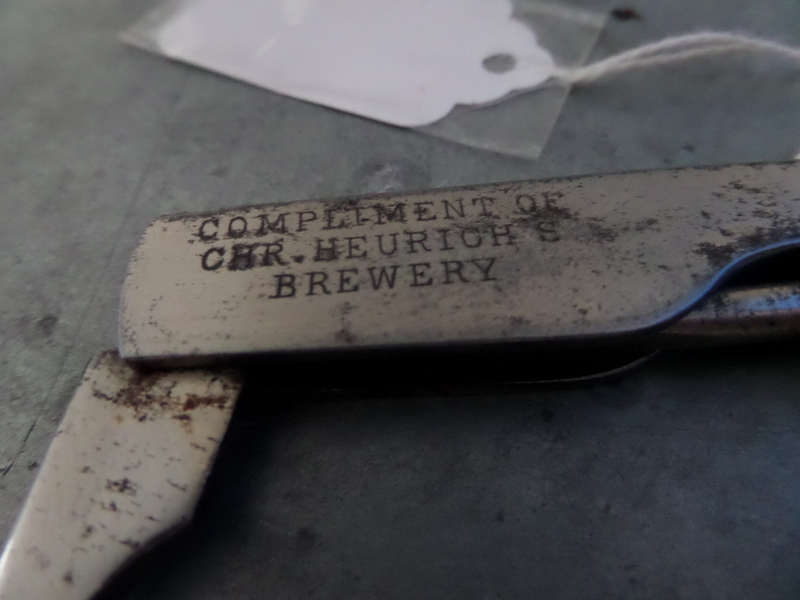 I don’t know why I keep finding Charles Heurich beer openers and corkscrews, but I do. And, two days ago there was another one. 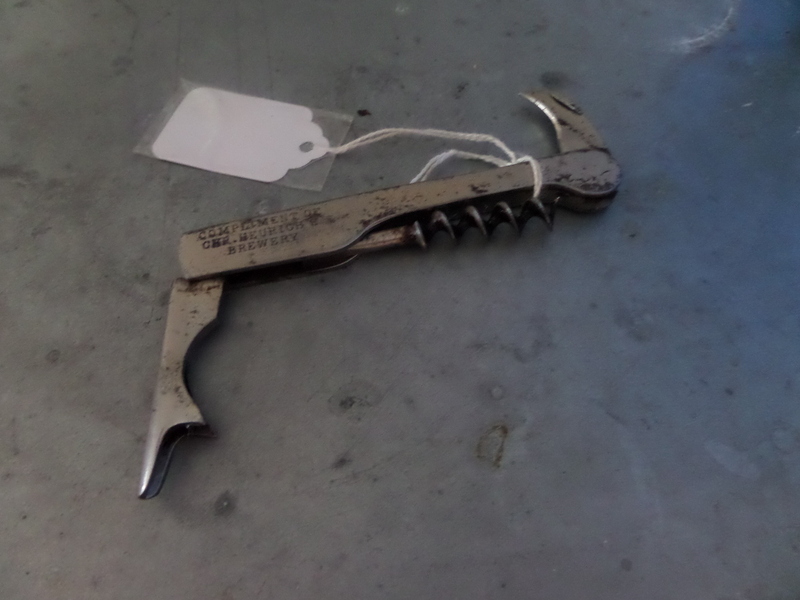 At a small antique shop on the mainland, I picked up a direct pull Murphy corkscrew and a Weinke patent with advertising for none other than CHR. HEURICH’S BREWERY. Now the JFO meeting won’t be happening until April of 2014, and I am guessing that this will end up in Tipped Worm Johnny’s collection before that–I am sure he has a corkscrew or two without beer advertising with which he will be willing to part. To tell the truth, we have been back home for a couple of days, but we needed to catch up a bit on local goings on… And, of course after being away for two weeks, there were a few things to address; piles of mail, voicemails, etc. For those of you wondering why no blog in a while, while were traveling, the internet was rather spotty, so I simply put away the laptop and enjoyed being somewhat disconnected to our online world. 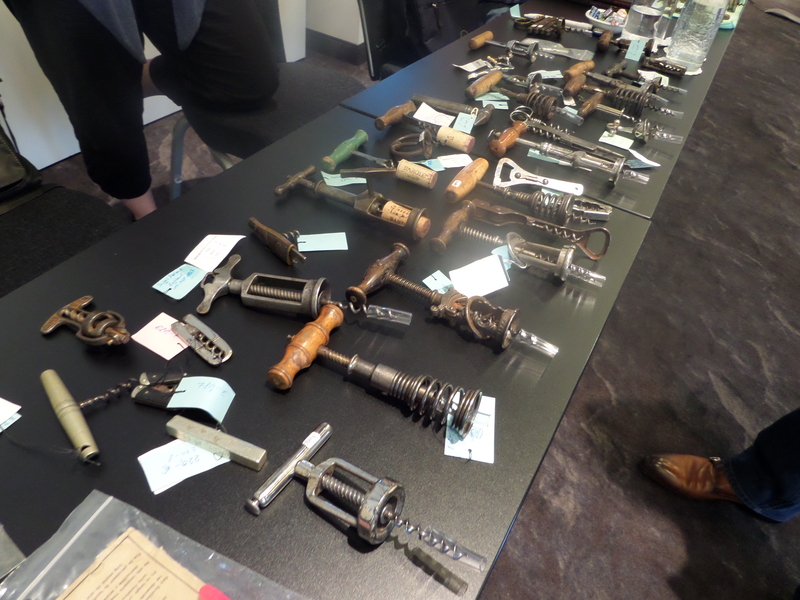 Now that we are back however, and everything seems to be in order, I figured I should catch you all up with the ICCA corkscrew meeting (and corkscrewing around Belgium). Following the viewing (and lunch and wine) we were off to Brussels for a tour, which was followed by a bus ride to Antwerp where the meeting would be held. The Antwerp meeting kicked off with the Right’s Reception where our newest Addict, Ron Cutajar, was introduced. 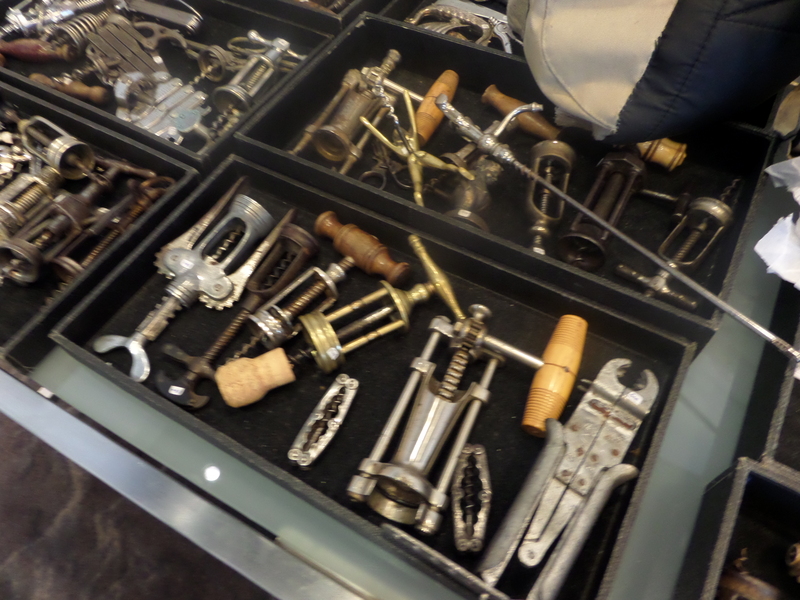 The next morning, we all headed to Brugge for a walking tour, and several addicts were seen darting in and out of whatever local antique shops they could find. 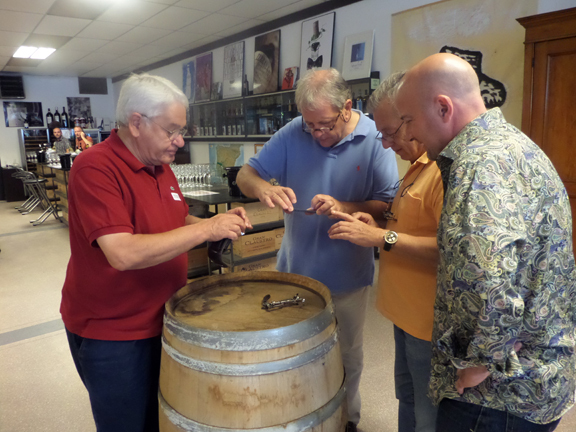 Word is four corkscrews were found, but none of the four were purchased. 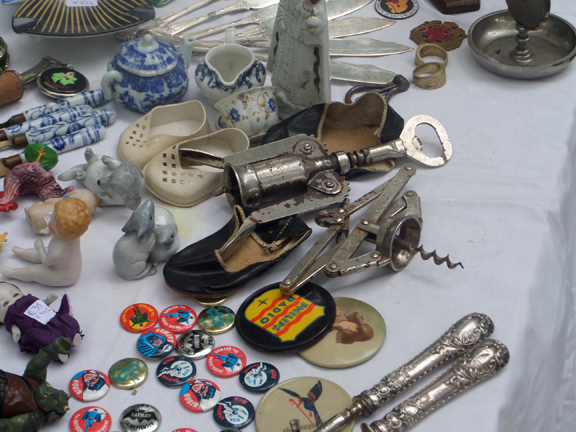 The next morning was the buy and sell, auction, and AGM. 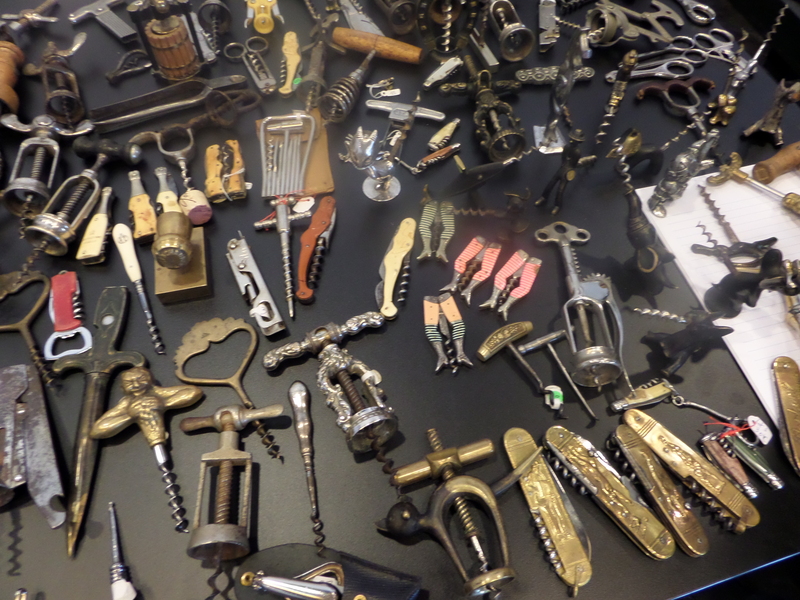 Many corkscrews changed hands, and I did actually buy a couple at auction. More on the acquisitions later (or tomorrow perhaps). In between all of this touring around, meetings, buying and selling, and auctioning, there were lunches, beer, wine, wine, wine, conversation, and a little bit of wine. Our last night, as a group, we held our AGM Gala dinner, and Ian and Sue’s punch was fabulous. Great food, followed by an unbelievable array of desserts made for a wonderful end to this year’s ICCA Meeting. With the meetings over, and goodbyes, farewells, and see you next years, exchanged the following morning, the lovely and I headed off to Brussels for a couple of days of antiquing and enjoying the city. A fantastic trip, some great times with dear friends, and we are looking forward to next year in Niagara Falls and Watkin’s Glen (which will be followed by a trip to NYC for the CCCC meetings as well). 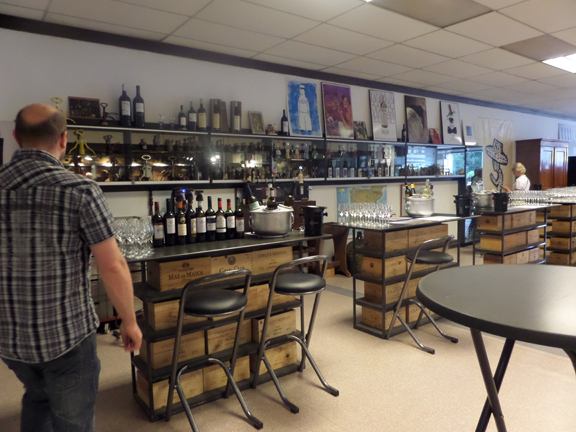 Whilst at the CCCC meetings, I was walking around during the Buy and Sell, and happened upon one member’s table who had several American patents, and in the corner–somewhat hidden away–was a Puddefoot. 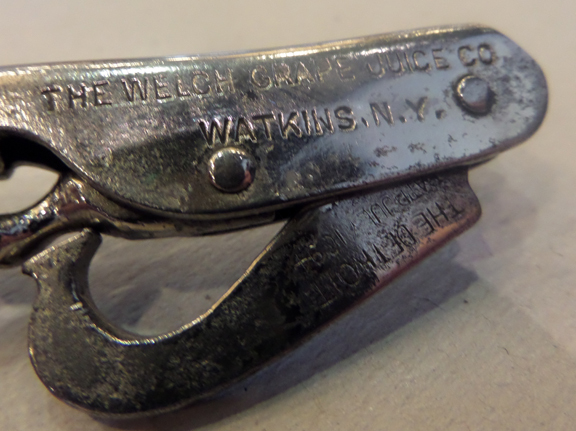 I picked it up, assuming that I already had that example, only to find that it was an advertisement for The Welch Grape Company, with a Watkin’s NY address. The price was fair, and it was an example I had yet to find. How cool that it also is the locale for our AGM Gala next year. 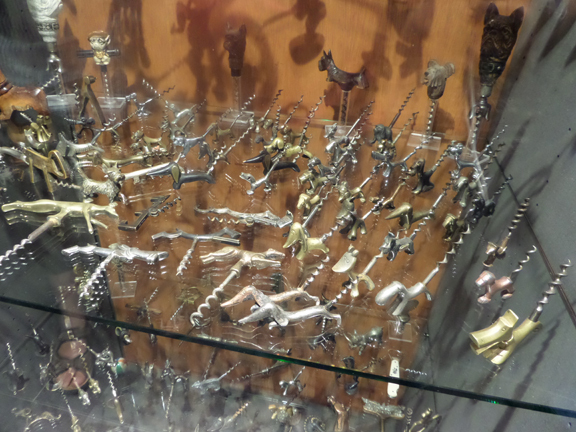 As mentioned earlier, I did acquire a few corkscrews over the course of both meetings, and a couple whilst corkscrewing around Paris and Belgium. A few will stay in the collection, one or two will be moved on to other collectors, and one might even make the best 6 of the year. After spending a few fantastic days in Paris (and celebrating our 20th wedding anniversary) the lovely bride and I hopped on a train (well, two actually) and headed to Leuven, Beligum for the CCCC Annual General Meeting. The first night, the meeting began with some champagne and appetizers, followed by dinner. It was great to see old friends, and reconnect with Nick Hunt (and family) who hasn’t been to a meeting in several years. Over the course of the evening, the conversation just flowed seamlessly, and it was a fabulous time. Saturday morning, after breakfast, we convened in the lobby and walked towards Domus; a small brewery here in Leuven. And, after a tour of the village, we had a tour of the brewery, and tasted their hoppy offerings–and lunch too! As we finished noshing, we headed back to the hotel to prepare for the auction and buy and sell. And, if you were in the mood to buy…WOW! After the buy and sell, during which I sold many and bought a few (one for Tommy, who now owes me 5 euro) the auction began. 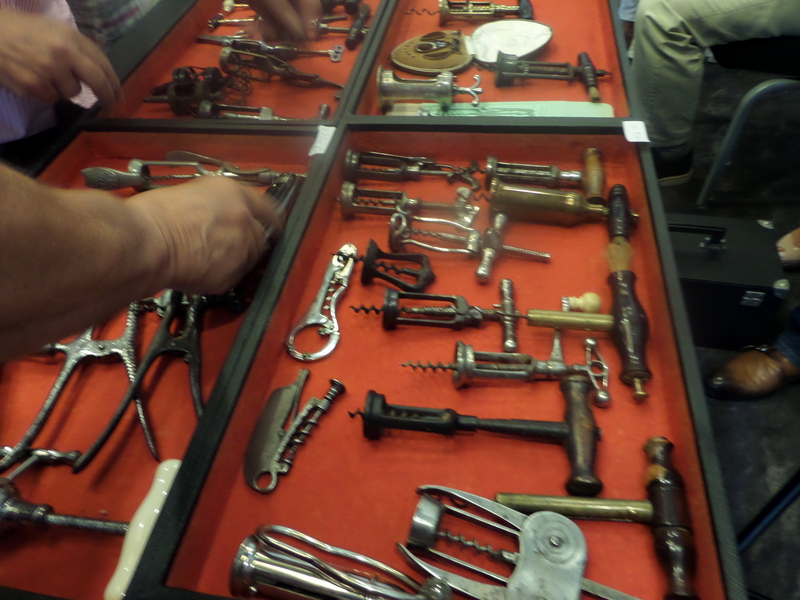 And, the bidding was quite exciting as a couple of rare corkscrews were reaching into the tens and nearly twenty thousand euros. Needless to say, I wasn’t in on the bidding on those. As mentioned earlier, at the Buy and Sell I did pick up a few for myself as well. Nothing in the rare category, but a few pieces that will make nice additions to the collection, and one tiny chatelaine folding bow which is destined to be a necklace for the lovely bride. Last night was our annual dinner and a good time was had by all. This morning included breakfast, a show and tell, our AGM, lunch. It has been a fantastic meeting, and at the AGM it was voted on that the 2015 meeting will be in Romania! What a fantastic adventure that will be! 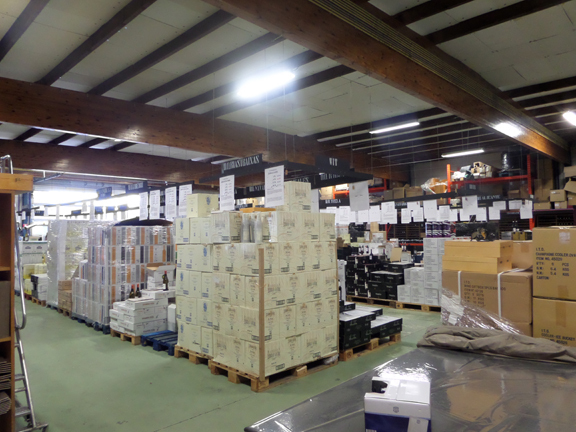 Tomorrow we head to Korternberg to visit Guy’s wine shop and see his collection, and then we are off to Antwerp for the ICCA AGM. 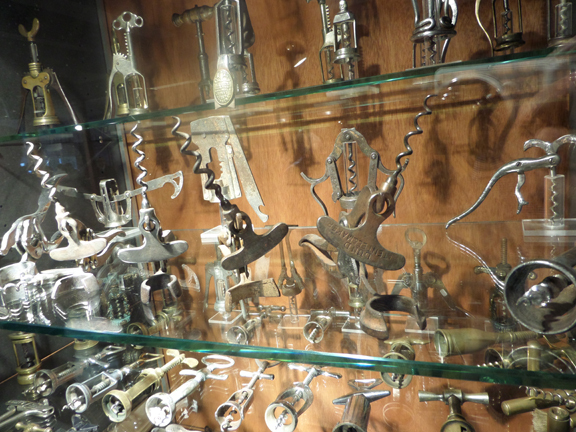 What corkscrews will turn up there? 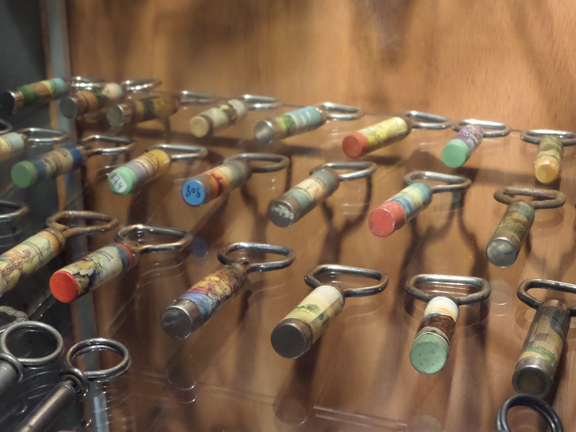 The pavlovian corkscrew juices are flowing! 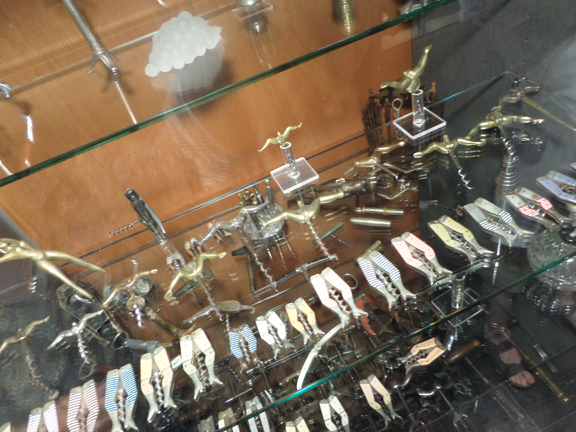 Over the last few years, Peter has been running this lark of a contest, where corkscrews that are purchased on eBay with a buy it now are tallied, and whomever secures the most, gets awarded a trophy; much more coveted than say, the Ryder Cup, or the America’s Cup, and certainly more desirable than the Stanley Cup. The contest, while all in good fun, is actually much contested. And, those that take part, often get their hopes dashed, when the contest committee, deems their appropriated BIN as not worthy. For me, I personally like the unsolicited BIN. 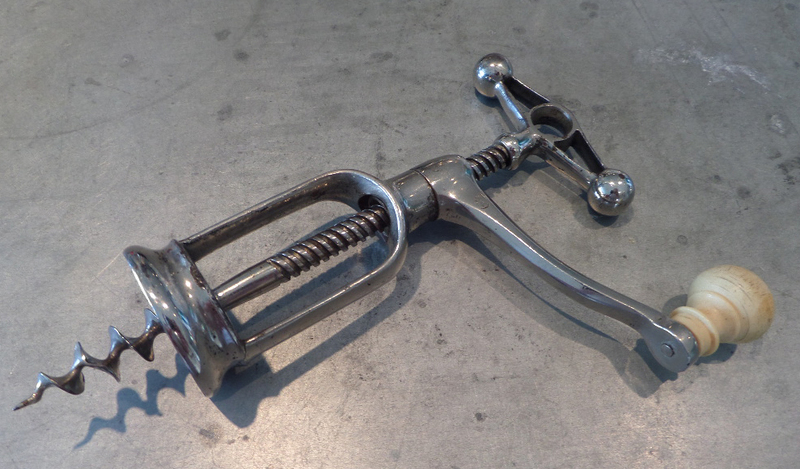 Someone finds a corkscrew, decides what their price is, and whacks it on eBay with a Buy it Now–or better still, Buy it Now or Best Offer. We are into the contest for all of about 21 hours, and so far nothing has been put forth by the usual suspects. Not for a lack of trying, I have no doubt. 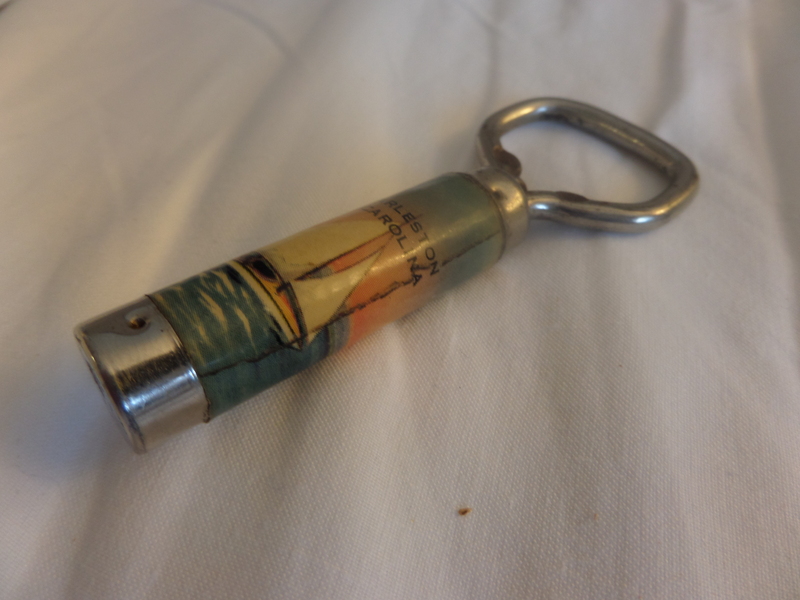 A few moments ago, while I was wrapping up some teaching duties, I happened to check eBay, and what should appear but a corkscrew with a whopping Buy it Now price of 15.99. As mentioned above, I greatly appreciate the seller who determines their price, and whacks it online. It would seem the early bird gets the worm (or helix as it were). I am pretty sure this will meet the committee’s parameters . Of course, as mentioned above, the contest is just for fun, and given we will be traveling the next two weeks in Europe, I am sure the trophy will end up in Peter’s, Tommy’s, or Gav’s trophy case. Who will find their name emblazoned across the trophy this year. My money is on Tommy!